If you’ve come across this post then you might be wondering how you can firm/tighten the skin on your face without any sort of surgery. Well face firming or skin tightening creams may be your answer. There are a myriad of products out there that claim to be able to firm and tighten the skin on our face, but can they do it and if so which ones do it the best with minimal side effects? Well in the post I aim to demystify the subject of face firming/skin tightening creams and present my recommendations on which ones may be best for you. Face Firming Creams – Do They Actually Firm and Tighten Our Skin? There doesn’t seem to be a huge amount of research to either confirm nor deny whether facial firming creams actually do what they claim to be able to do, and of the information that is out there some says yay and some says nay. Based on my own experiences and that of other women I talk to I think that they can definitely help to firm the skin on our face and I think they are an important part of the modern older women’s skin care routine. In my opinion, prevention is much better than cure when it comes to caring for our skin and I cannot stress enough the importance of looking after our skin when we are younger. However, no matter how well we look after our skin, we can’t stop nature and aging is a fact that we all have to deal with. Whether our skin starts losing its elasticity at 40 or at 60 comes down to the choices we make when we are younger. Luckily, we can now buy facial firming creams to slow down the aging process and in some cases, albeit temporarily, we can even reverse it! Based on my research and anecdotal evidence I believe that skin tightening and face firming creams do actually firm up and tighten the skin on our faces and they are definitely worth using. Face Firming Creams – How Do They Work? So this is something I’ve done a little research into over the years however it is important to note that I’m not a dermatologist or anything so please feel free to correct me if there is anything I am misinformed about. I may have also oversimplified so once again I welcome any corrections or more information. Why Does Our Skin Sag And Droop? First of all, it helps to understand why our skin needs firming in the first place. It is my understanding that there are 2 main aspects to this – collagen and elastin. As we age we have less collagen and elastin in our skin and our bodies make less of these substances and as a result our skin starts to droop and sag. 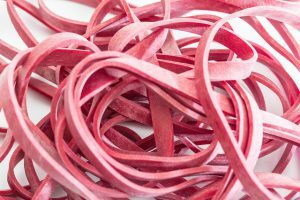 Elastin is just like elastic and it is the stuff that makes our skin ‘stretchy’. Just like when the elastic is worn out in old underwear or pants and then they become loose or saggy, when the elastin in our skin is degraded the skin becomes stretched and floppy, and does not return to its original condition. We can think of Collagen like padding or stuffing for our skin, and as it degrades our skin tends to droop. I like to think of it as skin with plenty of collagen is like a cake that rises nicely, whereas skin with less collagen is like a cake that doesn’t rise – all saggy in the middle with nothing to support it. So the end result for skin with less collagen and elastin is that it looks stretched with nothing to support it and therefore appears droopy and saggy. How Do Facial Firming Creams Fix This? The best face firming creams address the aforementioned issues and work to help support and increase collagen and elastin levels in our skin, which in turn helps our skin look and feel firmer and tighter. There are various ways in which they do this and I will outline this in the next section. What Are The Best Face Firming Creams For Women Over 50? The best face firming creams for women over 50 will help to firm and tighten the skin both in the short term and in the long term. There are different ways that collagen and elastin production can be stimulated but from my research the main things that a good skin tightening cream should contain are antioxidants and retinol. Many of these products also contain additional collagen and elastin but there is a lot of conflicting information around whether this can actually help. It is definitely best to help your body to produce more collagen and elastin in order to support the skin from the inside, but I think that adding extra from the outside can’t hurt. Antioxidants, especially Coenzyme Q-10 can help neutralize harmful free radicals that break down collagen and elastin. Studies have claimed that reducing free radicals not only stops the breaking down of these substances but also promotes increased production of both. 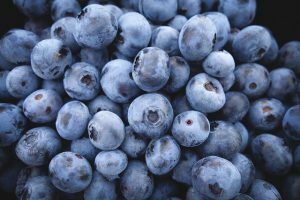 Blueberries and green tea are rich in antioxidants. Retinol or Vitamin A can improve the condition of the elastin already in your skin and can also help your body to produce more. It has also been shown to help your body produce more collagen so this is an important ingredient. It is found in carrots, dark leafy greens and many other vegetables. Finding the best facial firming cream for your mature skin can be a daunting and expensive task, so it is my pleasure to help you with this by sharing my experience and knowledge to help you select the best product for your skin. I really want to serve as best I can and I feel this is one way I can help. 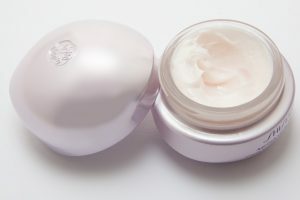 If you have oily skin then I would recommend something like Olay’s Professional ProX Hydra Firming Cream. This stuff is great for oily skin and really focuses on firming the skin without drying it out and making it more oily. I have heard nothing but good things about it, and it is great that it has an SPF 30 in it as well so there is no need for an oily sunblock. For many of us women over 50 with more mature skin we need something a bit stronger. In this case I would recommend the KESHIMA Ultimate Anti-Aging Firming Lotion. The great thing about this is that it is designed to be used on both the face and the neck, so we know that it is strong. The even better thing is that it works, and works well! I actually use this product on my arms and have noticed a real difference. I like to wear sleeveless dresses when I can and my arms are a problem area but this lotion has tightened the skin on my arms and gives me the confidence to wear what I want, so I am a huge fan. Sometimes skin treatments can be counter productive for those with sensitive skin, if they cause breakouts which can often be worse than whatever they were trying to address in the first place. 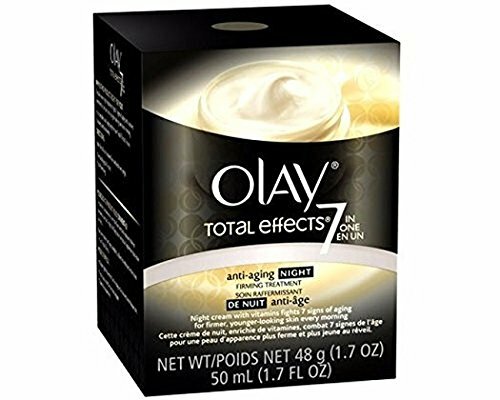 Olay Total Effects Night Firming Facial Mositurizer Treatment is a great skin firming cream for those with sensitive skin who want to firm and tighten their face but don’t want to worry about irritating their skin. It has a great consistency and leaves skin feeling hydrated rather than tight and dry which can sometimes be the case with other firming creams. For older women with sensitive skin, particularly those over 50, this is a really good firming cream that can be used on its own but when paired with the day cream can create really fantastic results. Ok so for dry skin, we need a face firming cream that also moisturizes and in my opinion the best one of these is the New York Biology Retinol. For women with dry mature skin, it is so important to keep facial skin well hydrated. Some skin tightening creams and retinols have a tendency to dry the skin however this is a moisturizing retinol that has been specially formulated to moisturize the skin as well as tighten it. Another great feature of this is that it contains green tea which is full of antioxidants to help rejuvenate and heal skin faster as well as tone and firm it. In my opinion one of the best value for money skin tightening creams that older women can use is Loreal revitalift. If you’re going to regularly use a lot on a large area (face, neck, chest, arms etc) then sometimes using a good quality cream will send you broke! In this situation I would recommend using something like Revitalift everywhere else and then using a better quality firming cream on your face. Revitalift is a decent cream that is quite reasonably priced and while it is not as good as some of the others I’ve listed it is definitely better than nothing. Thank you for reading my post about The Best Face Firming Creams For Women Over 50. I hope you got something out of it. If you have anything to add I would love to hear from you either through my Facebook,Twitter or Google + pages, or also please feel free to leave a comment below. Thanks again for reading and have a great day! Plastic Surgery Gone Wrong – Good Reasons To Avoid The Knife! Since I’m over 50 I read your article with great interest. Recently I was in Laguna Beach and a woman standing outside her establishment holding a jar of cream said “Please, come inside for just a moment…I want you to see what this miracle cream can do for your eyes” Well, normally I decline, but for whatever reason I found myself in her chair. She dabbed the cream onto the lower skin of around my eyes, the blew it dry. I have to admit it looked good, but only for an hour or so. The next time I looked in the mirror, it looked like an egg had dried on my face. LOL ….Anyway, I’ve always liked the idea of skin tightening products, but my skin is sensitive and I try to use only natural products because I know whatever I put on my skin is absorbed into the blood stream for tissue building. Do you know if any of these creams have chemicals? I’d like to check it out if so. Thank you! Great story Jackie, if only her cream produced lasting results! Every product has different ingredients, you can check the labels. With all skin care products it is really a case of try it and see as what works for some is different for others. Good luck!